Wolfgang Hammersmith is a U.S. Marine and black ops veteran from the Vietnam War era, so he knows what he's talking about. Born into a miltary family where his father shot bullets at him when he was 8 to desensitize him, Hammersmith was uniquely suited to life in the Corps. He was a combat team leader in Vietnam, and then went on to specialize in counter-terrorism and anti-human trafficking missions. Hammersmith led 86 combat missions in 41 countries, and he recounts 10 stories from those missions in a new book called Beyond the Call of Duty: Gunfight! 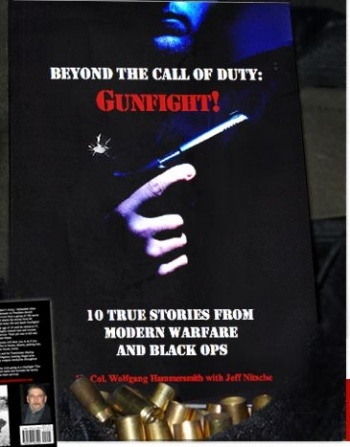 Clearly aimed at modern FPS gamers (the subtitle is "10 True Stories from Modern Warfare and Black Ops"), Hammersmith's book shows that he is considering the issues at stake in games which try to accurately portray what it's like to be him. "I do have concerns," Hammersmith said of videogames like Black Ops. "There are a lot of studies now that ask the question, 'Why do people like to shoot simulated people in videogames? Why is that really interesting for people to do?'" There is also the effect of what happens with soldiers who were "trained" playing FPS games growing up. "What happens in studies with soldiers is that when they play videogames, they were over-daring, because they were used to having 'more lives'. These guys get killed because they don't think that getting shot is going to be a big deal," Hammersmith said. But Hammersmith does recognize the value of games. "I think that one person calculated in the late 80s that there have been maybe 15 minutes of peace in the world since recorded history began," he said. "We have, for some reason, a penchant for doing damage and killing our own species. Maybe the videogames are a release of some of that drive." The gamers that he's met have also impressed Hammersmith. "But what I did find in mixing with the gamers is that they were extraordinarily respectful of the service contributions, and I found that to be a surprise," Hammersmith said. "I found the gaming crowd to be highly intelligent, motivated people who were excitable and thought [ful] when they asked questions." One of the problems with games that Hammersmith complains about is that even though they are becoming more like real combat, they often aren't real enough. "They just released Call of Duty: Black Ops, and I looked at the poster -- both pistols exhibited on the poster are 1911 A1 model pistols," Hammersmith said. "One of them has the thumb safety down with the hammer on, which is impossible to do on that gun, which means the pistol is broken. And the other one has got the hammer down with the guy's finger on the trigger, which wouldn't happen either." The perfect game, in Hammersmith's opinion, would emulate a combat environment to teach gamers how to really act in such a situation. "I think games can wield people's attention, and maybe even teach them how to wield their own attention," he said. "Let's have a way to shut off auto-aim and extra lives, and having infinite ammo, and let's find a way to turn off the radar so you don't know where your opponent is. Let's have a game that allows you to use more of a field, to do things that make tactical sense." I'm not sure that a game like that would be fun for everybody, but I'm pretty sure the purists would eat it up.